Don't expect the drawings to have been corrected if they found any mistakes This is a Martin Error's design. That is why I said the drawings will hopefully have been corrected. I thought it was supposed to be 14 1/4"? Text said the error could not be taken out by playing with the smokebox as it created other issues but that was the full 1/4" error so may not hold true for 1/16"
14 1/4" - 14 3/16" = 1/16"
Edit: Taken from the Conway article page 1499: The length of the boiler barrel must be 14 1/4", not the 14" as on the drawing page 1130/1. 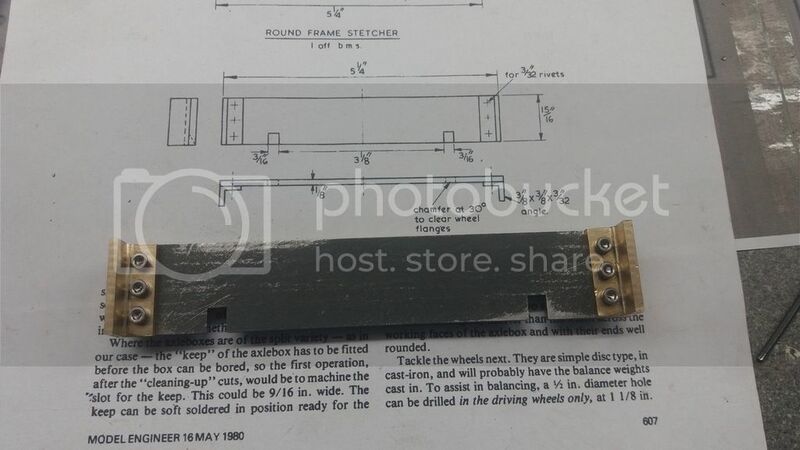 This means that the smokebox tube plate is set in 1 1/2" from the outer end of the barrel, not 1 1/4" so that the lengths of the tubes and flues are unaltered. This is important as if the barrel is made only 14 " long, the throat plate would foul the rear coupled wheels, unless the smokebox was pushed further to the rear or made 1/4" longer and that would require further changes. O rings were not around when these engines were designed! This is important as if the barrel is made only 14 " long, the throat plate would foul the rear coupled wheels, unless the smokebox was pushed further to the rear or made 1/4" longer and that would require further changes. Thats what I said that having to stretch the smokebox will create other issues or as ME put it "require further changes"
Question is why did Rich make it 14 3/16" and not 14 1/4"
Looks like the length of the boiler tube is the only recognised "feature"
"I am using an earlyish set of drawings and the ME articles. I have found that, due to increase boiler length, the back of the ashpan hits the derailment angle at the back of the frames. I will move it back. The brake rods run INSIDE the frames. The ashpan side tubes are the inner width of the frames. Drop the aspan and it hits the brake rods! Martin Evans drawing shows two brake cross members, I found, after making them, they are not necessary, the brakes are not connected side to side. Two brake rod couplings are drawn by M.Evans., a further two are required ( but with only one rod connection) for the front brake." Made a couple of bits that don't require a lot of explanation. A straight forward turning job. 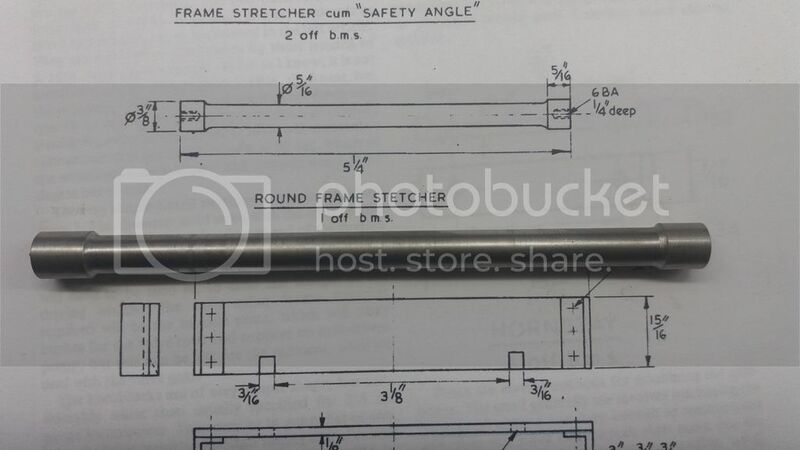 The plans specify bright mild steel and BA threads. 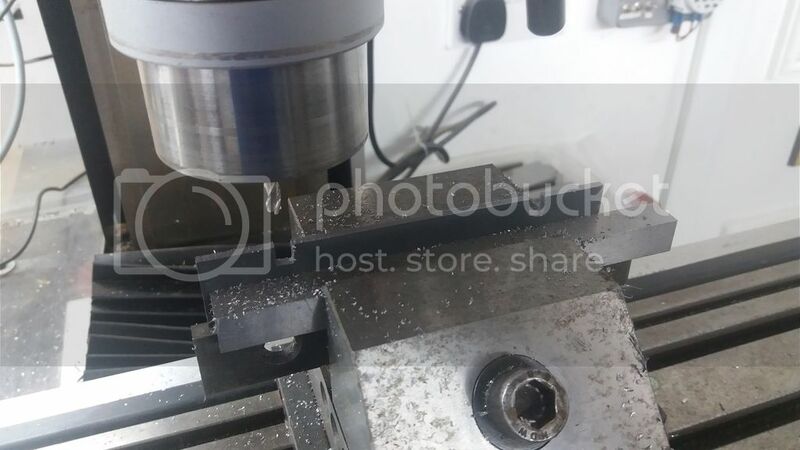 I have used a bit of stainless steel because it was the only bit of 3/8" I had and tapped 4mm. The other strethcher similarly I have used slightly differnt materials to those specified but I can't see a problem. 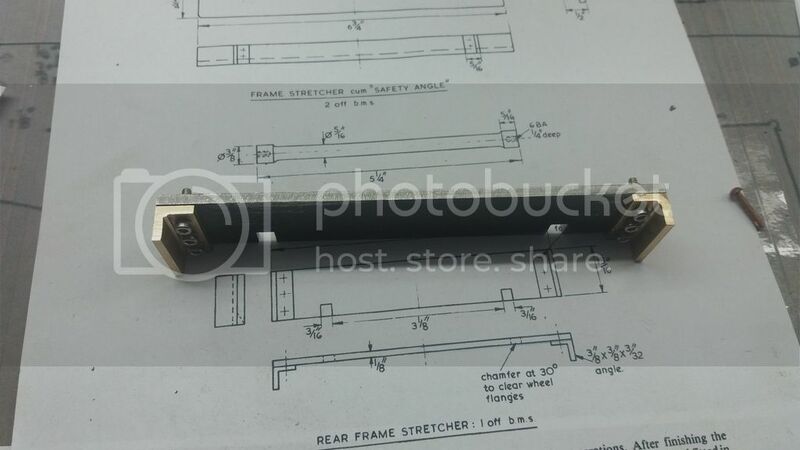 Specified is 1/8" steel plate but I have used 3mm, only .008" thinner and I had to make a bit of angle by machining down a bit of brass angle. 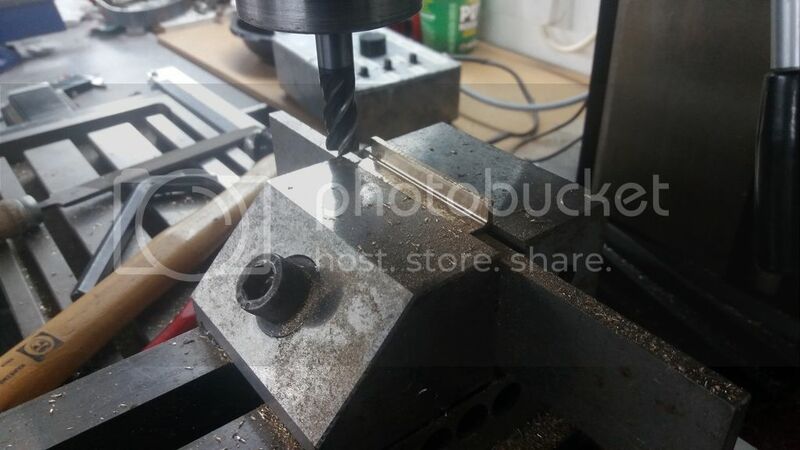 At the moment it is all held together with 2.5mm stainless steel cap heads instead of rivets. If they don't get in the way I'll leave them in.